Following up on our last hacking adventure, the Kickstart Concepts team decided to return to Techcrunch:Disrupt (this time in San Francisco) to participate in another hackathon. We built and launched Pinnokio, an application that lets users tell little white lies to their social network. The site won Honorable Mention from the panel of judges. 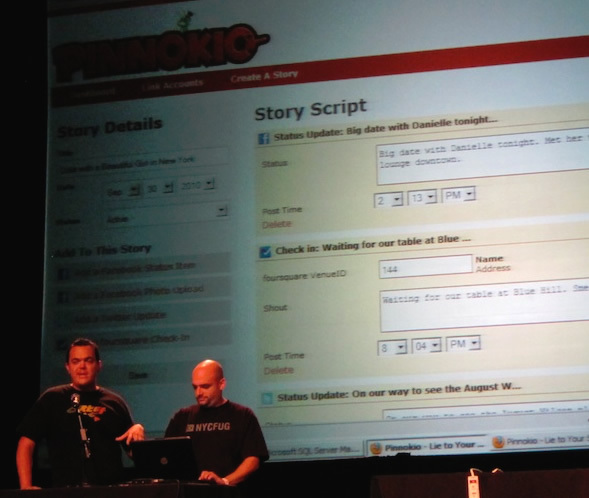 The concept behind Pinnokio was simple: we all brag to our social network about all the cool things we’re doing, so why let the truth stand in the way of a good story? 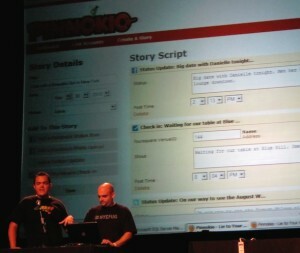 With Pinnikio, a user connects the site to their Facebook, Twitter, and foursquare accounts, then selects a “story” to share. The site had several prebuilt stories, such as being out on a date with a beautiful woman or meeting with clients. Once selected, Pinnokio would then push out status updates, send tweets and even upload photos to a user’s profiles, sharing an exciting story with their social network. So what if it isn’t really true! Interesting. Now Show the World! At Disrupt, it’s not just enough to build your idea. You then have to present. This is about as punishing as a presentation can get. You have 60 seconds to demo something you just built, that you aren’t sure will even work, to a room of over 400 experts, with zero prep or practice, all after working for 18 hours straight with no sleep in the last 32 hours or so. If you can pull that off, be honest: you’re a rock star. We enjoy participating in these hackathons for a few reasons. Not only is it a real test of your ability to churn out great work under a tight deadline, it also validates everything we believe about product development here at Kickstart Concepts. That when you’re focused on agile development and constant tweaking, amazing products can be built in a short amount of time with limited resources. We preach it constantly, but it’s always nice to see it put into practice outside of our normal business. And kudos to the Techcrunch team for another great Disrupt. Looking forward to the next one.